My maternal grandmother, nani, makes delicious besan ka laddus. Years ago I stood by her side watching as she transformed pale yellow chick-pea flour into a dark yellow gorgeously nutty and rich aromatic mixture moistened with a generous quantity of ghee by slow cooking it over the flame. Sugar and crushed cardamom was kneaded into the hot dough after it was removed from the flame and cooled a little. She then rolled bits of dough into small round balls in her palms, pressed a thumb into the center and sprinkled some chopped pistachios into the indent. A perfect contrast of green and yellow. Nani continued to send me boxes filled with laddus as the years went by. Whenever she asked “what can I send for you,” I knew she meant the precious laddus. My husband became a devotee of the laddus, as did Agastya, both the boys consuming them with far more abandon than I ever could. Our newest addition to the family, Vasisht, arrived a little under three months ago. When I looked at his rounded limbs and little face with my fond new mother gaze, my first thought was, “what a little laddu.” His own nani, my mother, arrived the next morning straight from Calcutta, bearing of course the laddus from my nani. When those ran out my mother boldly approached the stove in her characteristic “let’s try it, how hard could it be, we know how they should taste” way. What resulted were laddus that, I have to confess, were even better than my nani’s. Perhaps because they were hot from the stove. Perhaps because a warm appetite arousing roasted-besan aroma filled our home as they cooked. Perhaps because they were made with specially ordered organic grass-fed, free roaming cow ghee from Princeton. Whatever it was. 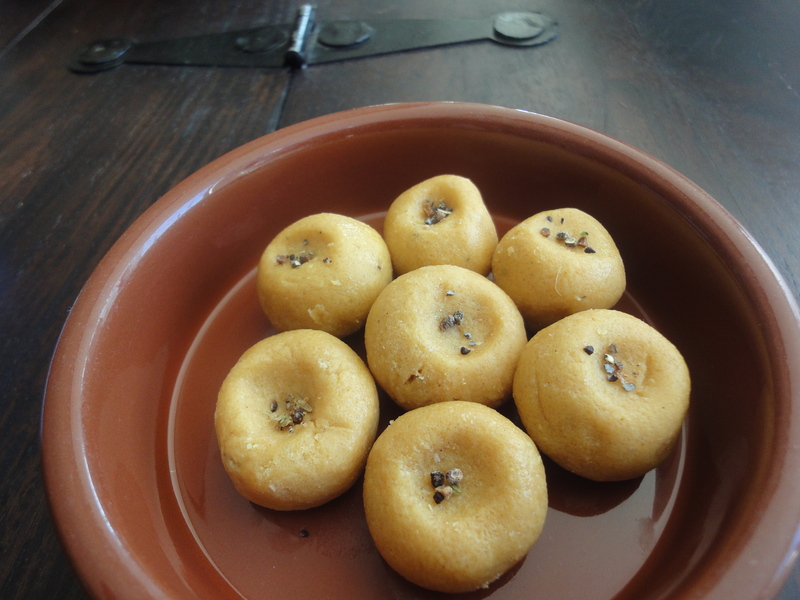 I stood by and made mummy teach me how to make the laddus again and again. First I watched, then I made them while mom supervised, and then I made them again. After working with small quantities a few times – the key here is to experiment with small quantities for faster cooking and to minimize waste – our recipe was perfect. These laddus can’t really be found anywhere except in your kitchen or that of your mother or grandmother. Store-bought ones taste terrible: they are full of compromises on ingredients, cooking time, flavor, love. Here is the recipe, in honor of the little laddu (or “yaddu” as his brother says) who has just arrived in our home. 1. Heat ghee in a non-stick pan on medium flame. When the ghee is just a little warm (not hot), add the besan and mix well. Add the sooji and cook on slow flame for 30 minutes, stirring frequently. Note: the besan becomes very hot over time. 2. As the mixture cooks, it will become more malleable and start to gather in the middle of the pan. Watch for this softness and a subtle change where the the entire mixture becomes shiny and smooth, which means that the ghee has released. As you cook it further, the besan will turn into a deep golden yellow color. Remove from flame and set aside to cool. 3. Knead sugar into the dough after a few minutes, when the mixture is still fairly warm, along with the crushed cardamom. The dough will feel deliciously warm and pliable. 4. When fully cooled, roll out into little balls, garnish with crushed cardamom (as shown in picture) and serve. Sorry. It is just me and not the food network. I love your posts. They remind me of growing up with my grandmother’s and mother’s cooking. A woman from India takes me home to Belize when she writes and cooks! I think it is wonderful. Thank you for your warm comment! The laddus look more like pedas! Good to have you back writing, I’m assuming this means that all your boys are behaving themselves? I am salivating. What fabulous blogs!! I am the richer for logging on finally!! Am allergic to all things pertaining to the kitchen but you are going to make a convert, and how!!!! Love you and keep up the good work, darling!! Hugs and kisses to the inspiration for this particular blog and to his precious elder brother!!! dear devika, what a treat it is to read your blog ! delighted you are back to updating it! loved this entry in particular.